This is my occasional series of good news stories. It’s a look into what the future will be. These stories deal with some of my favorite topics: Clean water, renewable energy, banning plastic bags, and opportunities for girls. Second, Even though the United States has pulled out of the Paris Agreement, many U.S. Mayors Endorse 100% Renewable Energy Goals, Read it here. Third, Electric cars: Volvo Cars announced all of its new models will be electric or hybrid by 2019. France intends to end sales of gasoline and diesel cars by 2040. Norway and India will go to all electric cars in the next decade. General Motors is rolling out the Bolt, and Tesla is building a more affordable electric car. Hopefully, charging stations will catch up to the demand! Read more at electric. Fourth, the historical land of windmills is leading the charge in wind energy development. As of January 2017, Holland, the land of windmills, has powered all public transport trains by wind power. Read about it at Future. Fifth, The island country of Australia knows the damage plastic is doing to our oceans. The two biggest supermarket giants, Woolworth and Coles, both announced plans to phase out single-use plastic bags over the next twelve months. Woolworths stated that from July 1 next year, its customers will need to bring their own bags when they go shopping, or purchase re-usable ones in-store. Shoppers in New South Wales, Victoria and Western Australia will be affected by the ban. Finally, a very happy story, the girls robotics team from Afghanistan was allowed to come into the United States to compete in robotics. Read at Afghan girls. Author health4earthPosted on July 21, 2017 Categories diversity, good news, healthy, sustainableTags Afghan girls, future, plastic bag ban, Renewable energy1 Comment on Ready for Good News! **India plans to make every car electric by 2030, and Volvo is going to make its first electric cars. ** Switzerland says yes to renewables, and to exit from nuclear power. This is my occasional series on good news. Author health4earthPosted on June 1, 2017 July 20, 2017 Categories good news, healthy, sustainableTags electic cars, Germany, good news, India, Norway, Oklahoma, Renewable energy, Scotland, Switzerland, Tennessee, volvo1 Comment on Its Good News! To make the world a better and safer place we must generate positive energy. This is another round of amazing news stories that tell us in what direction the future is moving. I congratulate these countries and communities for their sustainable goals and effort. This is my occasional series on great news stories. Renewable energy, managing trash and gender equality are some of the positive energy stories of the past week! 1. In September Kenya is going to ban plastic bags. Read about Kenya here. 4. The United States installed a record-smashing 14,762 Megawatts (MW) of solar power in 2016 — a 97 percent jump over 2015, according to data just released. For the first time ever, solar was the number one source of new generating capacity, beating out wind and gas. Read about it at solar power. 6. Sweden is on target to be powered entirely by renewable energy by 2040. An amazing goal for this dark northern country. Read about at Sweden. What sustainable exciting things are happening in your community? Today I’m starting an occasional series on good-news events. Three stories have made me happy this past week, and I hope you enjoy them as much as I have. *First, this is amazing. New Delhi, India, banned plastic bags and single use plastic. It will make a difference for our oceans, and Delhi’s air quality. A plastic ban will not be easy to implement, and I wish them luck. Read about it from Independent News, and from Ecowatch. 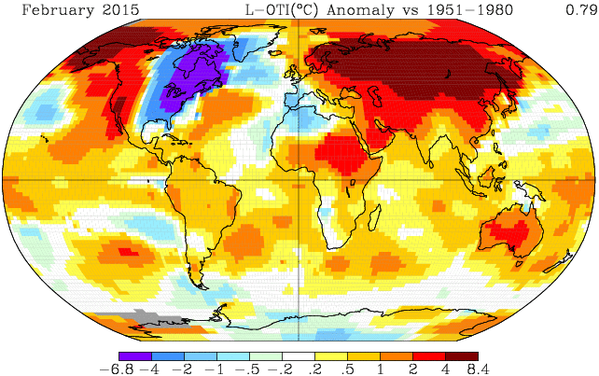 The first two months of 2015 were the hottest on record globally. One place was a cold peninsula?? We are one day passed global earth hour sponsored by the World Wildlife Fund. Even if you could not participate, I hope you will think of ways to reduce the electricity you use. Working together to cut our use of fossil fuels(Most of our electricity comes from coal) can make a difference!